Woofie was sad. Until we discovered the Redondo Beach Dog Park. The big dog park. It goes on way past the towers. 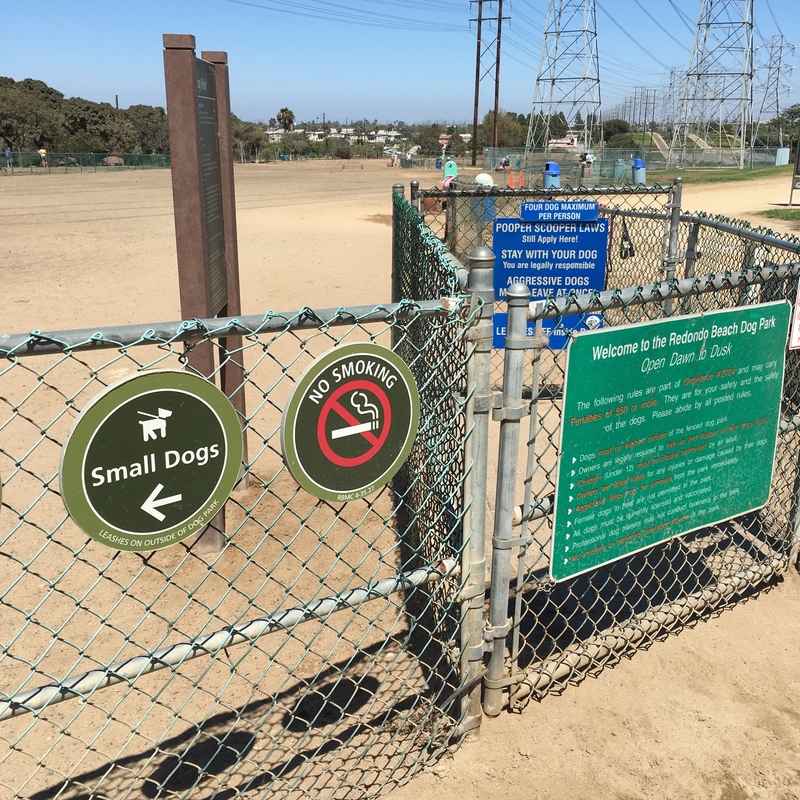 The Redondo Beach Dog Park is a shockingly large undeveloped area in Los Angeles County. There are two fenced areas: a small one for little dogs, and a massive one for large dogs. The big dog side even has an extra area that could be closed off, but is usually open. Dog owners come from all over. Some dogs aren’t very social – they just want to stretch their apartment-cramped legs chasing tennis balls. Woofie also loved people. Though his “hello” to men was disconcerting. Woof would prance over, jam his snout into a guy’s crotch, and flip his oversized head back. More than one guy doubled over, cringing, while his buddy also doubled over, laughing. Andy, too, found this hilarious. Men are mean like that. Woofie invariably found several dogs to wrestle and run with. Most of the dogs were friendly, as were the owners. And then there were the Purebred Dog Owners. They had their own cliques. Breed cliques, really. The Rhodesian Ridgeback owners all came on certain days, to meet up with other Ridgeback owners. They only talked to each other while their dogs played, but they didn’t seem to mind if Woofie the Mongrel played with their purebreds. The same held true for the Great Dane clique and the Bernese Mountain Dog clique. The Australian Shepherds didn’t have a clique – their dogs were all loners intent on balls. The owners of energetic working dogs like Huskies, Labrador Retrievers, Golden Retrievers were the most numerous, but they’d gratefully thank anyone who had a dog willing to wear out theirs. The Poodle People, though, were the Ultimate Clique. If you did not have a show dog with a continental cut, you and your dog did not exist. The Poodle People all met at the far end of the park and huddled together. They even closed the annex gate to keep the rescued riffraff away. But you know what’s great about dogs? Dogs don’t care what other dogs look like. Dogs also don’t believe in fences. A gorgeous black standard poodle with her continental show cut leapt over that gate. She galloped into the mass of mutts. The mutts chased her. Tongue out, having the time of her life, that poodle blazed a trail around the park’s perimeter, like comet trailing a canine tail. Her owner followed, screeching, “Call off your dogs! She’s a show dog! Get your dogs away from her!” She huffed hopelessly after Queen Coquette Show Poodle. Some fifteen minutes later, Queen Coquette Show Poodle’s owner dragged her out of the park. Queen Coquette was coated in dirt, bark shavings, and a several cups of Woofie’s drool. Her owner looked pissed. Queen Coquette looked thoroughly unrepentant. Alas, we never saw Queen Coquette again. She’s probably bored out of a her skull on an ivory dog bed somewhere. As weird as the Poodle People were, at least they paid attention to their animals. Plenty of other owners would sit on a bench while on their phones, utterly ignoring their dogs. It’s against the rules – you’re supposed to stay with your dog — but it’s not a problem if other you have a dog who gets along with all other dogs. It IS a problem if your dog decides he has a problem with another dog. And what happens a negligent owner has a big, potentially aggressive dog, going after a smaller one? I’ve spoken to a lot of disgusted owners who’ve had their dog stitched up. But sometimes, dogs get lucky. Sometimes Woofie is there. –only to skid to a halt as Woofie bounded in front of the little dog. Woof barked, poking his big snout at the Shepherd. The Shepherd backed off, surprised. He barked back at Woofie, then lunged in at the Golden from another angle. Woofie cut in front once again, whining and flipping his head. Again, the confused Shepherd backed up. For two very long minutes, Woofie countered the giant German Shepherd’s every attack on the little Golden, without biting or becoming aggressive himself. Woofie just got in the way. Kind of like he did in the kitchen at home. The owner finally showed up, snapped a leash on the German Shepherd, and dragged the dog out of the park, showered by various owners’ angry, outraged shouts. She hugged Woofie one last time. He gave her a tongue facial. I soon left the dog park with my so-called Hero Dog. He’s a beautiful dog with a caring personality. No matter if he didn’t understand he was rescuing a damsel in distress. All that matters is that he was a hero. Remember that when he digs up something. 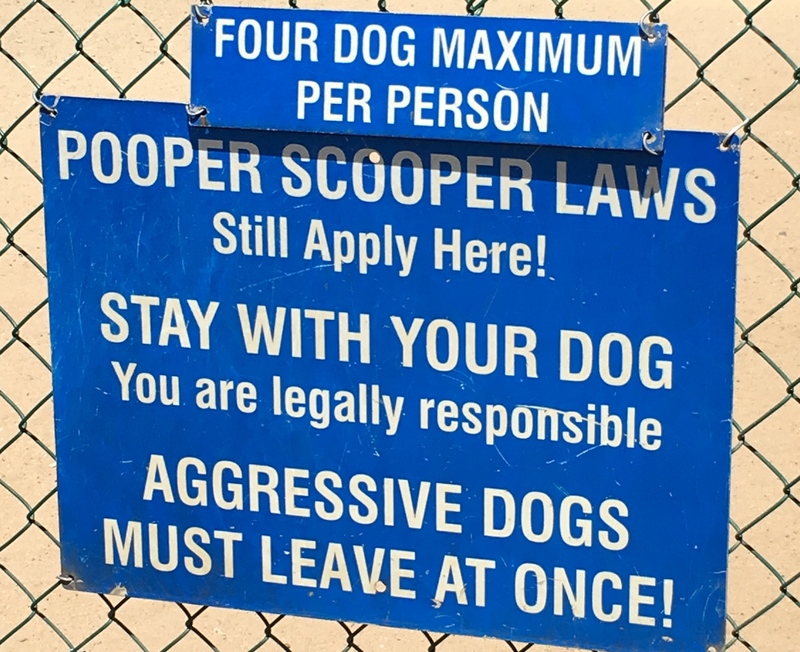 I don’t have a dog but I know there are issues sometimes at our local dog park. I have friends who no longer use it. There is a German Shepherd that could use some courtesy lessons that comes frequently with a disinterested owner. My friend JM says dogs are like people. Some dogs like one everyone. Some dogs hate other dogs. And sometimes, two dogs just don’t get along. But if you have an iffy dog, you have to be on top of them. I saw two German Shepherd owners working really, really hard to socialize their iffy rescues at the park once.They made everyone nervous, but they were trying so, so hard. Kudos to them. If your dog is iffy, you need to pay attention. People are like dogs. Some sniff crotches and generally make you uncomfortable. And some growl. Many snap! 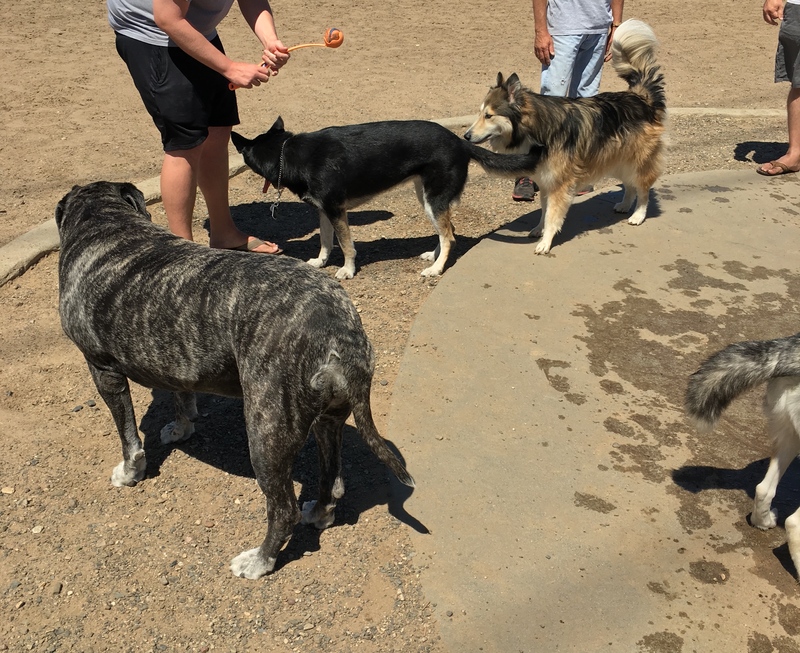 I never thought there would be cliques at the dog park according to purebred, but man, was I wrong. It is socal after all! Yeah, I always thought it was dog people versus cat people, but I guess serious breeders must protect their investments and mutt owners are often contemptuous of thousand dollar show dogs. We have some champion basset hounds in our neighborhood, though, and they are adorable. Though very drooly. Doggy cliques and jealousy! So you really think Woofie did want to play with the German Shepherd? It sounded like by the time the owner came, he was just warming up. I wouldn’t be surprised if he could actually go on like that for an hour. You know, that would be quite a show. He already sounds like a bit of a celebrity and I am sure he will be recognised when you go out with him. I am sure I took that picture of Woofie because he’d just had a bath and was especially shiny. He’s usually got more dirt on his coat, because he loves to dig and roll. He thinks he looks fantastic always! Dog parks are great. There is actually an expat dogs club here in Siem Reap. They meet on Sundays in a park like setting between fancy hotels. Good choice! We stumbled upon a friend there once with his rescue dog. Shaggy thing – I’m not sure how he sees behind all that hair. So what kind of dogs do you mostly see in Thailand? Big? Small? Street dogs? Purebreds? Small dogs are usually less well-trained. Because if they misbehave, their owners just pick them up! In Cambodia, we generally see mutts, street dogs. It’s rare to see a pure-bred. In Thailand, almost the same, but Thais have more $$$ so you’re starting to see more variety. So only the ex-pats have the pampered dog who lives inside and has their own bed, mostly? I wish we had a dog park! Nico always has to be on a leash, because many people are scared of “big” dogs here. Even though she’s pretty small for a golden retriever. Well, she also has to be on a leash because if I let her free she would eat all the trash she could find. LOL about the trash. Golden Retrievers are notorious for being insatiable eaters and being able to eat food in seconds. They rival Labs in that respect. So is it mostly small dogs? I remember sadly watching the whole Tibetan Mastiff craze in China. Love this story! 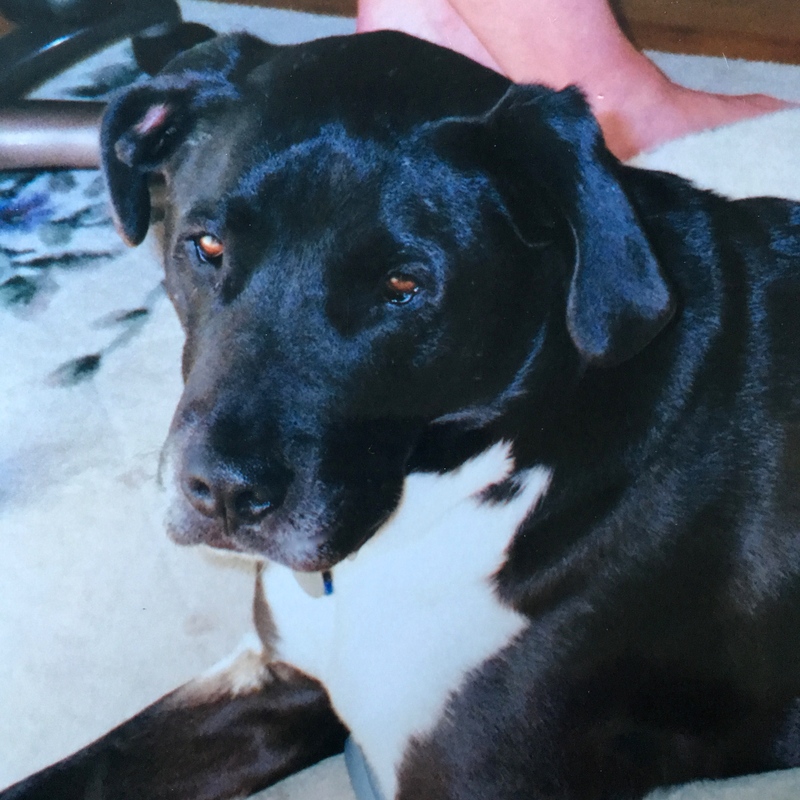 What an awesome dog and the ending made me smile ☺ We want to adopt a rescue dog but can’t have a dog in our apartment – we are looking at a dog sharing site where maybe we can take other people’s dogs on walks and to the park. City life. Are there a lot of shelters? We have a ton, and people volunteer to walk dogs there. Only now, thanks to the Pokemon Go craze, some are “renting” shelter dogs to adults who want to disguise their game-playing. There are lots of shelters – not sure if there are any nearby but will definitely look into that option for dog walking. Haha I think Pokemon Go is doing more for people’s fitness than any exercise program could! I bet people learn to cheat, tho! And I miss my big wolf (malamute-husky). He was rescued as a sickly, shy pup and I spent my entire life socialising him into a happy (but stubborn) one. Thank you, Shelley! Oh, I bet your big wolf was BEE-YOO-TEE-FULL! Also, I bet your vacuum was busy. Good job with your rescue and socialization. Woofie – the hero that saves the day!! So, do the owners dress up their little dogs like that do here and stroll them around in carts/strollers? Usually I only see dressed up for Halloween. But the dyeing of the fur is popular on certain breeds. I know. But at least the poodle gets out to dog shows? And she’s not on a chain in the backyard. Ah! Tales from the dog park. You really lucked out with Woofie–or maybe you chose well. I like to think that he really did want to rescue the Golden Retriever.